I do my best to live a healthy lifestyle. But there are times that I want a soda. Not a two liter bottle and most times not even a full can. Still I want a soda. Since my soda craving comes and goes, I can't just run to the store at odd hours of the day. The percent solution to my craving, SodaStream. Many families may have a SodaStream in their homes. But the company is always seeking to improve its devices based on consumer input. The new SodaStream Source offers improved ease of use and a sleek design. 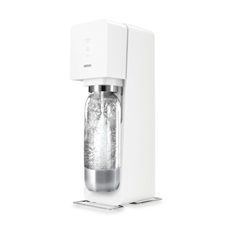 The SodaStream Source was created by Yves Behar, the world-renowned designer and social entrepreneur. This newest version offers an elegant soda maker that combines beauty, functionality and efficiently. Different from other versions, the Source carbonating bottle easily locks into place with a single-push motion. Instead of pushing a button, the entire top surface is responsive to touch. The best part is the LED display. The carbonation strength is visible through the LED display. The user knows exactly the level of carbonation. I really like the SodaStream Source not only for the soda it produces but also for the design. I have our sitting on the kitchen counter. Now I have soda how I want it and when I want it. Plus, I feel good know that 1 SodaStream bottle can replace 2,000 bottles and cans. SodaStream can be purchased online at http://www.sodastreamusa.com/ or locally at many major retailers. Stop lugging around bottles and cans. Get soda at home for a fraction of the cost with the SodaStream Source.